Looking for gifts in Thirsk? Our garden centre has a not-so-secret shop for gifts in Thirsk. The stock in our gift shop is sheer variety. You will probably not find gardening related gifts in the shop but you will get a lot of items related to kitchenware and some cute, little things you could present to children. After all, we have a gift for everybody. Our gift store is stocked with the aim to have gifts for people of all ages with particular focus on the lady of the house. The kitchenware and china are perfect tributes to her endless contributions in running the house in an orderly fashion. Similarly, the baby towels, plates, and cereal bowls are to make her job during the day easy. You can give these very affordable gifts to friends and family for their special day. The best part is, since your present is something they will get to use frequently, they will remember you with a smile every time they do. If you are not sure what to get your friend for their special day just around the corner, visit our gift shop in Thirsk and talk to one of our sales people. Tell them your preferences and what kind of things your friend likes and they will find you the most suitable items to pick from. You can also browse our giftware on the website. Feel free to call us if you have any questions. 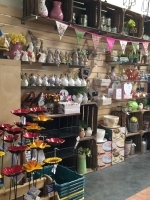 Visit our garden centre soon and get these chic gifts in Thirsk for your friends and family!